There's a lot to like about shares of Baker Hughes, a GE company, Suncor Energy, and Total. Any value-conscious investor has to be seriously looking at the oil and gas industry right now. Despite the fact that oil prices have improved materially over the past two years, and many businesses have lowered their costs enough to make a decent profit at today's prices, Wall Street is still pricing the industry at similar levels to the bottom of the market back in 2016. Clearly, investors should be at least looking at stocks in this industry, so we asked three of our investing contributors to each highlight a great company in the industry to help you get started. Here's why they picked Baker Hughes, a GE Company (NYSE:BHGE), Suncor Energy (NYSE:SU), and Total (NYSE:TOT). Travis Hoium (Baker Hughes, a GE Company): Low oil prices have depressed earnings across the energy industry, and that's no different in a service business like Baker Hughes. But now, oil prices are on the rise, and the number of rigs drilling for oil around the world is increasing, which should lead to an improving operating environment for Baker Hughes. As one of the world's biggest energy services companies, providing oilfield services, equipment, and other solutions, this isn't a direct play on energy prices, but there's no denying that more drilling will be good for business. As the price of oil rises (today it's trading near $67 per barrel based on the WTI price), it should lead to an increase in demand from oil explorers for services from companies like Baker Hughes. That's exactly what we're seeing, too, with orders rising 4% in 2017 to $22.0 billion, and the global rig count up 9.8% in March versus a year ago, to 2,179 units. Financially, the improvement is going to take a little longer. Revenue fell 5% in 2017 to $21.9 billion as relatively low prices hurt demand. The distraction of General Electric (NYSE:GE) taking a controlling interest in the company may have also led to some poor performance as management was distracted with the buyout. But long term, the increase in oil prices should help demand, and having GE as a majority owner should help drive a greater number of solutions for customers -- and growth for Baker Hughes long term. Reuben Gregg Brewer (Suncor Energy Inc.): Canadian oil company Suncor Energy has a unique focus in the oil industry, with roughly 82% of its 2017 production coming from oil sands. Oil sands are mined, not drilled, and are a somewhat misunderstood asset. Most investors view oil sands as expensive, which is only half true. It is expensive to build an oil sands mine, but once up and running, these assets tend to have relatively low operating costs. And they have incredibly long reserve lives. To put some numbers on that, Suncor estimates that its Canadian oil sands assets have a reserve life of 40 years and operating costs of $34.50 per barrel (cash cost plus sustaining capital expenditures). Add in the dividend, and the company's break-even cost was just $45 per barrel in 2017. Now add to this the fact that Suncor has a new oil sands asset, called Fort Hills, that's starting to come online this year. It also has a major offshore drilling project (Hebron) that's ramping up, too. Over the next few years, Suncor is set to increase production at an annualized rate of 9%. But the costs for this growth are largely in the past. To be fair, the price of oil will have a huge impact on Suncor's results, as it would with any oil company. But assuming oil prices don't fall out of bed, Suncor looks set to reward investors with solid dividend increases (rising at roughly the pace of its sustainable funds flow growth) and notable share repurchases. This should translate into a higher stock price. 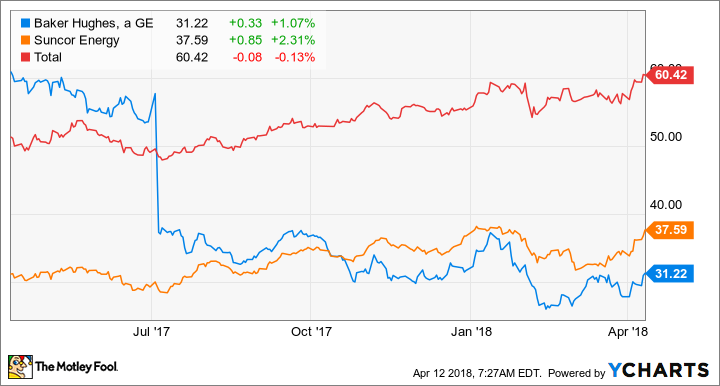 With a current yield of 3.3% and strong growth prospects now that the big development costs of recent years are over, Suncor is worth a deep dive today for growth-minded oil investors. Tyler Crowe (Total SA): It is hard to be unimpressed with the results this French oil giant has posted in recent years. Thanks to some serendipitous timing of new production projects coming on line just as oil prices started to decline, the company was able to quickly respond to the market by reducing capital spending and focusing on wringing out every efficiency possible from its operations. As a result, the company was not only able to generate as much free cash flow as it did prior to the oil price crash, but it was able to outpace its peers in terms of returns on equity -- a position that ExxonMobil has held for years. If that wasn't enough of a feat for investors to be excited about the future, management also pulled off the dual feat of making some big acquisitions and reducing net debt at the same time to levels below what we saw pre-crash. So, we have a company with a better balance sheet, improving returns, some well-timed acquisitions, and a management team that wants to start increasing its dividend and buying back stock. That should lead to a premium valuation, right? Nope. Shares trade at an incredibly reasonable price to tangible book value of 1.6 times. 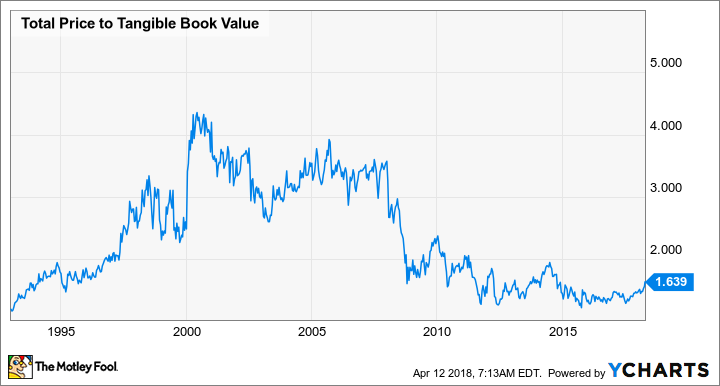 TOT Price to Tangible Book Value data by YCharts. At these prices, and with the potential Total has over the next few years to grow its business in production, LNG, petrochemical manufacturing, retail, and even renewable energy, Total's stock looks like quite the valuable stock worth considering for your own portfolio.